More than 300 jobs are to be created over the next five years by a global professional services firm expanding its European operations in Scotland. The jobs at Genpact in Glasgow will be in digital solutions, risk management, insurance claims, business process transformation, and customer service. The investment is supported by a £3.1m grant from Scottish Enterprise. 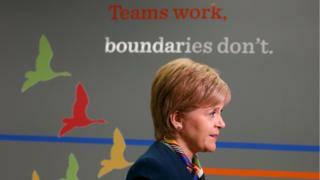 First Minister Nicola Sturgeon welcomed the announcement during a visit to Genpact's Glasgow office. She said: "Scotland continues to be recognised as a prime business location for global companies looking for a foothold in and access to Europe. "This is thanks to our exceptional skills, business infrastructure, low cost base and global business network. I am delighted that Genpact will locate its new European facility in Scotland, with support from Scottish Enterprise." Genpact has around 165 employees in Glasgow, who specialise in wealth management servicing and digital platforms for financial services companies. Mohit Thukral, senior vice president at Genpact, said: "Expanding our presence in Scotland with this strong government partnership advances our strategy of strengthening both our onshore delivery and digital solutions capabilities. "The Glasgow metro area has provided an exceptional talent base and favourable economic climate, especially for our financial services business. Our planned expansion will further leverage these benefits as we drive more digital-led transformation business impact for our clients." The company has a presence in more than 20 countries. Paul Lewis, managing director of international operations at Scottish Enterprise, said: "We are pleased to be supporting Genpact's investment in Scotland and delighted the company has chosen Glasgow for its prestigious European expansion project."